Politicians rail about welfare queens, crack babies and deadbeat dads, but what do they know about the real struggle it takes to survive being poor? Journalist LeBlanc spent some 10 years researching and interviewing one extended family-mother Lourdes, daughter Jessica, daughter-in-law Coco and all their boyfriends, children and in-laws-from the Bronx to Troy, N.Y., in and out of public housing, emergency rooms, prisons and courtrooms. LeBlanc’s close listening produced this extraordinary book, a rare look at the world from the subjects’ point of view. Readers learn that prison is just an extension of the neighborhood, a place most men enter and a rare few leave. They learn the realities of welfare: the myriad of misdemeanors that trigger reduction or termination of benefits, only compounding a desperate situation. They see teenaged drug dealers with incredible organizational and financial skills, 13-year-old girls having babies to keep their boyfriends interested, older women reminiscing about the “heavenly time” they spent in a public hospital’s psychiatric ward and incarcerated men who find life’s first peace and quiet in solitary confinement. More than anything, LeBlanc shows how demanding poverty is. Her prose is plain and unsentimental, blessedly jargon-free, and including street talk only when one of her subjects wants to “conversate.” This fine work deserves attention from policy makers and general readers alike. 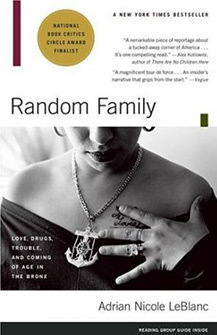 LeBlanc’s first book, Random Family, was a New York Times Bestseller, a finalist for the National Book Critics Circle Award, and the winner of The Anisfield-Wolf Book Award and the Ridenhour Book Prize. LeBlanc’s work has been published in The New York Times Magazine, The New Yorker, Esquire, Elle, Spin, The Source, The Village Voice, and other magazines. She holds a B.A. in sociology from Smith College, a Master’s of Philosophy and Modern Literature from Oxford University, and a Master of Law Studies from Yale Law School. She has also been the recipient of numerous awards, including a Bunting fellowship from Radcliffe, a MacDowell Colony residency, and a Soros Media Fellowship from the Open Society. LeBlanc lives in Manhattan. Adrian Nicole LeBlanc: "Stories Are Everywhere"